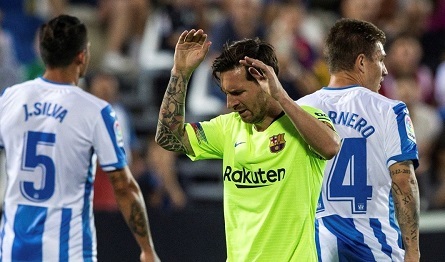 Barça fall to Leganés 2-1 for first league defeat. FC Barcelona lost for the first time this season after losing in Madrid to Leganés. Barça took the lead early in the first half courtesy of a powerful volley from outside the area. However, Barça’s lapse of concentration at the back cost them twice in a short time span as Nabil El Zhar and Oscar Rodriguez score rapid goals to give their side a shock 2-1 lead and ultimately, shock upset victory. This result means FC Barcelona are still league leaders since Real Madrid also fell 3-0 away to Sevilla. The Blaugrana will have a few days to get over this loss because they will be hosting Athletic on Saturday. Leganés: Cuellar; Juanfran, Bustinza, Tarín, García, Silva; El Zhar (Nyom 86’), Vesga (82’), R.Pérez, Óscar (Gumbau 74′) & En Nesyri. Goals: 0-1, Coutinho (min 11); 1-1, El Zhar (min 53); 2-1, Óscar (min 54). Cautions: Ruben Pérez (min 40), Bustinza (min 49), Nyom (min 88) En-Nesyri (min 90); Umtiti (min 60), Vermaelen (min 64). Previous Post10 men Barça battle to a 2-2 draw with Girona. Next PostBarça winless again after 1-1 draw to Athletic.